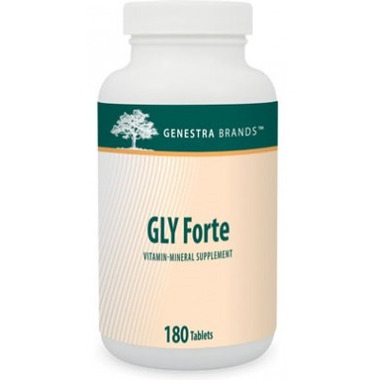 Genestra GLY Forte is a combination of vitamins, minerals, herbs, and glandular extracts traditionally used in organotherapy. B vitamins help mediate hundreds of enzymatic reactions, including the metabolism of carbohydrates, fats and proteins. Niacin, thiamine and biotin help to provide substrates for energy production in the Krebs cycle, while vitamin B6, vitamin B12 and folate are involved in the conversion of homocysteine into methionine for protein production. Vitamin C is also involved in metabolic reactions as a co-substrate for several enzymes. It is necessary for the synthesis of carnitine, which transports fatty acids to the mitochondria for energy production. As a necessary component for the synthesis of collagen, the primary structural protein found in connective tissue, vitamin C also has a role in wound healing. As the most important aqueous antioxidant, vitamin C donates electrons to prevent free radical damage to DNA. It can also increase the use of selenium, another member of the antioxidant defence system. Both selenium and iodine are both primarily found in the thyroid gland. Iodine is essential for the production of thyroid hormones, which regulate macronutrient metabolism and the growth and development of the body.